It is advised to keep a copy of the ETA approval notice with the traveler to be produced at the port of entry in Sri Lanka. All applicants, except children below 12 years of age, must pay an ETA processing fee online. The online payment must be paid with a valid debit or credit card. Click here to see the ETA processing fee.. If you wish to stay more than 30 days in Sri Lanka for tourism purposes, an application must be forwarded to the nearest Sri Lankan diplomatic mission to obtain a long term multiple entry tourist visa. If the length of your stay in Sri Lanka is less than 30 days, the applicant or third party his/her behalf can apply for the business visa by submitting a business ETA applications visa from the ETA website, www.eta.gov.lk. If you are unable to submit the online application due to technical reasons, the duly completed applications can be forwarded to the closest Sri Lanka Diplomatic Missions to apply on your behalf. Letter from the sending US organization. Passport – n.b. The validity of the passport must be at least six months beyond the date of entry in to Sri Lanka. If the length of your stay is more than 30 days, you must apply for a long-term business visa. Processing time: 1-14 business days. n.b. If the passport on which the visa/ETA has been issued expires before the visa, the new passport should be submitted to the Consulate General for the issuance of a new ETA. This will be done at no cost to the applicant. Please note that if you are not leaving the airport, a transit visa is not required. The applicants themselves or a third party on their behalf can apply for a transit ETA by submitting an ETA application online via the ETA website www.eta.gov.lk. For last-minute travelers who need to visit Sri Lanka on tourist/transit purposes without prior ETA approval, a limited facility to obtain ETA is available at the Bandaranaike International Airport in Colombo. An additional fee of US$ 5 will apply. Holders of diplomatic or official passports visiting Sri Lanka for official purposes have to apply for visa at the Consulate General of Sri Lanka in Los Angeles. Visas will be issued free of charge by the Consulate General for diplomatic and official passport holders traveling to Sri Lanka for official purposes. Please note that diplomatic and official passport holders traveling to Sri Lanka for other purposes must follow the relevant application procedure. If the length of stay in Sri Lanka is less than 90 days, diplomatic and official passport holders must apply for a short-term diplomatic or official visa. Processing time: 1-10 business days. Holders of diplomatic or official passports traveling to Sri Lanka on long-term assignments in their relevant diplomatic mission in Sri Lanka must apply for a long-term diplomatic or official visa, as relevant. Processing time: 7-14 business days. Residence visa is issued to non-Sri Lankans to whom it has been decided to extend residence facilities for the purpose of investment or otherwise, in circumstances where the prescribed authority is satisfied that their stay in Sri Lanka and the pursuit of their vocations are not prejudicial to the best interests of Sri Lanka. To obtain a residence visa, the applicant must enter Sri Lanka on an entry visa issued by a Sri Lanka diplomatic mission abroad. Entry visa will be issued by the Consulate General only upon approval by the Controller General of Immigration and Emigration. The applicant must clearly state that he/she wishes to apply for a residence visa when applying for the entry visa and submit the necessary supporting documents. A tourist visa cannot be converted into a residence visa. Visa fee of US$ 100 (Payable by money order/bank certified check or cash in favor of the Embassy of Sri Lanka.) An additional US$ 30 is charged to return the passport to the applicant by post. All media personnel visiting Sri Lanka should obtain a visa prior to arrival in Colombo from the Consulate General of Sri Lanka. Media personnel visiting Sri Lanka on a media assignment cannot enter Sri Lanka on a tourist or business visa. Visa fee of US$ 40 for less than a 30-day stay in Sri Lanka. US$ 140 for the visits which are longer than 30 days. (Payable by money order, bank certified check or cash in favor of the Embassy of Sri Lanka.) An additional US$ 30 is charged to return the passport to the applicant by post. Processing time: 1-7 business days. 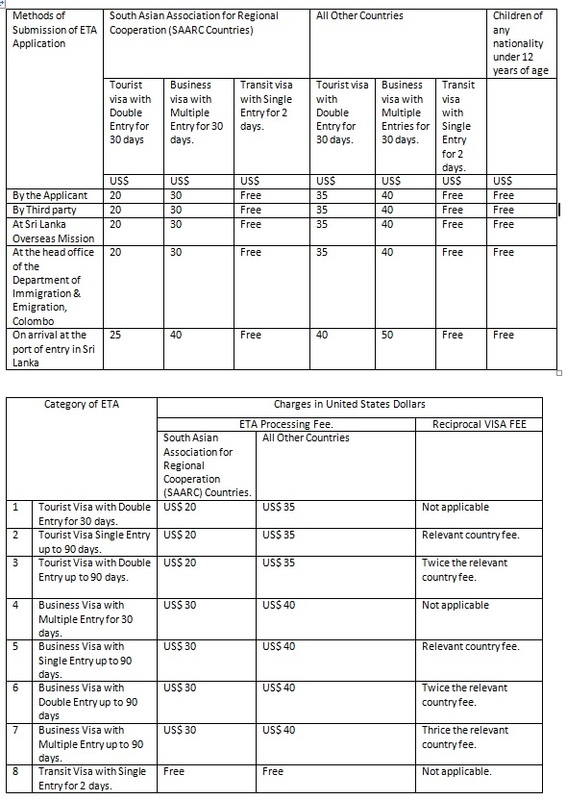 Tourists, who are visiting Sri Lanka from the United States, are exempted from ETA Visa scheme from May 01st, 2019 to October 31st, 2019. Tourist visa can be obtained on arrival on free of charge at the Bandaranayake International Airport, Colombo, Sri Lanka. ETA process fee has been revised and the new fee schedule will be effective from December 28, 2015 click here to see the ETA Process Fee. With effect from 1st January 2012, all Holiday or Business travelers to Sri Lanka must have a valid Electronic Travel Authorization (ETA) to enter in to Sri Lanka. Please visithttp://www.eta.gov.lk for more information. N.B The validity of the passport must be at least six months beyond the date of entry into Sri Lanka. All citizens of the United States and Mexico planning for short visits to Sri Lanka are required to obtain Visa for the purpose. The visa should be applied online though Electronic Travel Authorization (ETA) system on www.eta.gov.lk. The above is applied for all non U.S. citizens other than the citizens of Maldives and Singapore irrespective of the country of their residence. 01. If your intended visit to Sri Lanka is a short-visit please log on to www.eta.gov.lk and click on Apply to start the application process. 03. You may be required to pay the visa fee when you are applying visa for a period more than 30 days as applicable. The Visa fee when applicable can be paid online, or at the port of entry to Sri Lanka or to the nearest Sri Lanka mission. 05. Receive the approval notice or a referral notice in case of your ETA application being rejected sent your email within 24 hours upon the receipt of your acknowledgement notice. 06. If you receive a referral notice informing that your ETA application has been rejection please contact the consular section of the Permanent Mission of Sri Lanka for further assistance. 09. Diplomatic and Official Visits – Citizens of United States, Mexico and U.N. Passport holders in the United States, planning to visit Sri Lanka on official purposes should submit their ETA applications to the Department of Immigration and Emigration through the Consulate General of Sri Lanka in Los Angeles. 10. If required, you can still submit your ETA applications through the nearest Sri Lanka Mission.